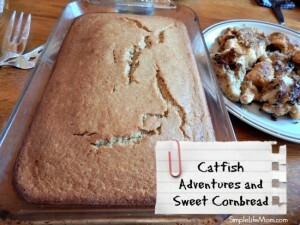 Our Catfish adventures and sweet cornbread didn’t start just yesterday. We have had an amazing past few weeks with family! First we were able to travel to visit grandparents, cousins, siblings, aunts and uncles in Kentucky on my husband’s and my side of the family. There we got to catch up a little with people we dearly love. At my brother-in-law’s we sang praise songs for a few hours as my husband and each of his siblings had a different musical instrument that they played. Now that’s what I call a family ho-down 😉 We put out a field fire, and my kids harvested enough of my grandparents’ apples to make 10 pints of apple sauce!! Big weekend! I realized that my kids didn’t even know how to bate a hook. I remembered how great it is to have experienced family members around. I realized…again…how removed from our food we actually are. We went out fishing three days in a row. For the younger ones it was nice that the pond we went to had a playground near by, because they needed a playground break occasionally. But for my oldest, there was nothing to draw him away. He was so determined to catch something big. The first day my daughter caught 2 little bluegill and was convinced that there was a giant “Sea bass” pulling on her line a few times (it was stuck on the bottom). The second day we went to a different lake and had no luck. The third day we went out just for a short time to a pond close to my house and everyone was catching bluegill and crappie. 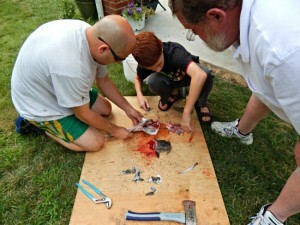 Tiny little guys, but my eldest son kept mentioning how big his fish was (it was 4 inches long). Finally, right before we left, his bobber went under and he started reeling. A few minutes later (and much shouting and jumping up and down on my part) he had brought in a 20in catfish! He was so proud! My other son immediately wanted to name it, but we told him you don’t name food. He named it supper, ha ha. What’s really great is that he fixed it himself. He did not want to at first (which is when I thought, again, how removed from our food we really are). My dad and husband worked with him and taught him step by step what to do…a kind of initiation into manhood 🙂 and I felt very blessed to have a husband and parents who are so hands on and ready to teach. We really need to value what others can pass on to us and continue that to the next generation! We ended up having a feast that night; including corn on the cob, green beans from my garden, cornmeal battered catfish, and cantaloupe. The Cornbread recipe was originally adapted from a great Taste of Home recipe. It has a lot of wheat flour in it compared to other more dense corn breads. And it is oh so good with a slab of butter on top! I believe sweet cornbread is a southern thing. I know some people like it dense and non-sweet, but this really is my favorite. It’s not sweet like cake, just lightly sweetened so that it goes great with some salty catfish. A sweet and fluffy cornbread. Cream butter and sugar in a large mixing bowl. Pour into a greased 13in x 9in baking dish. Bake at 400 Degrees F for 25 minutes, or until fork inserted comes out clean. He called it supper! lol That is great. Boys are awesome! 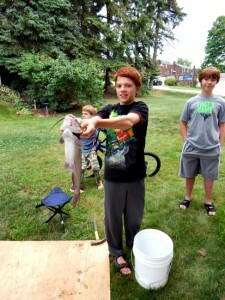 Sounds like you and your family had fun catching the catfish and that is so important these days to spend time with your kids. I haven’t eaten catfish for many years but I really used to love it. 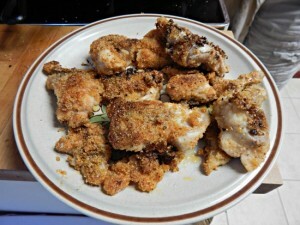 Thanks for sharing on recipe and family experience on Real Food Fridays Blog Hop. I love cornbread – unfortunately I’m allergic to corn… 🙁 Your recipe sounds wonderful, though! 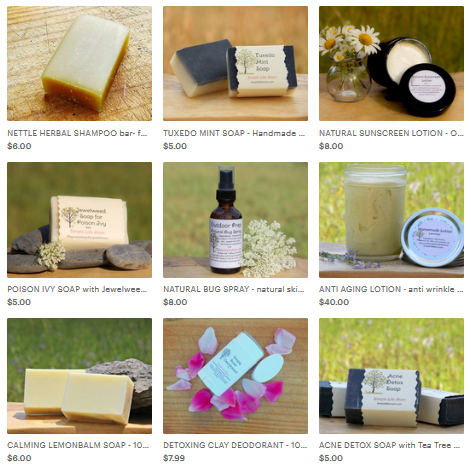 Thanks for sharing at Savoring Saturdays!